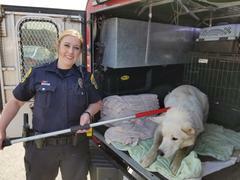 On May 17th at 11:12 AM, Sworn Humane Officer Mallory Meves responded to a dog bite at a residence on the west side of the city. 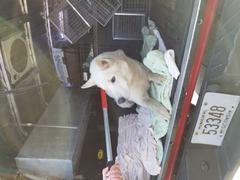 In the investigation, Officer Meves seized a white wolf hybrid that was responsible for biting a victim. A wolf hybrid is a cross between a wolf and domesticated dog and are illegal to possess within the Green Bay City limits or proper permitting through the WI DNR. The wolf hybrid bit a juvenile victim that was unprovoked. The wolf hybrid weighed 107.5 lbs, and stood 37 inches tall. See attached photos.